This is a wonderful book and a must read, once I started I was unable to stop until I read the last page!! Emily Woodhouse is a penniless, homeless widow thanks to her recently deceased husband. His gambling ways have placed her in a desperate situation. Faced with working off his debt in the basest of ways, she chooses instead to accept Tyler and Xander’s unconventional marriage proposal. She won’t be marrying one man, but two. Tyler and Xander know instantly that Emily is the one for them. Not only does the widowed young woman rouse their protective natures, she knows of their customs regarding a two husband marriage. 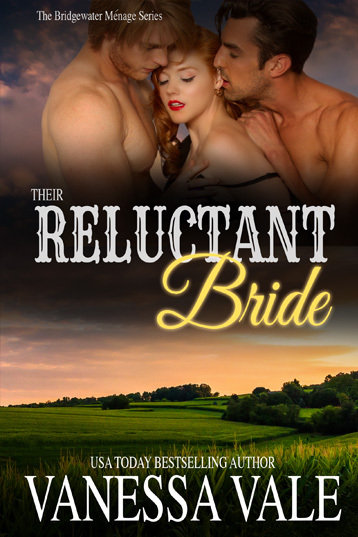 Despite the fact that Emily needs the safety they can offer, she isn’t eager to remarry. She might be reluctant, but they will show her what it will be like with two men to cherish, protect and possess her. But the past catches up with them in the most dangerous of ways. Only in facing the past can they forge a future together.